Twitter is the best place to find talkative astrologers every day, with great horoscope links to share. These are the most recent additions to my Twitter feed. There are more every day, though, so to find them and our regular tweets about the astrological questions of the week, please follow me @jessicacadams if you’re not already there. Lots of great astrology fans are also on my feed if you want to extend the conversation. Bohemian Astrology – Joanne Madeline Moore is a widely experienced magazine and newspaper astrologer based in Australia. Traditional Astrology – Peter Stockinger practises traditional astrology and also has long lists of Twitter astrologers to follow every Friday. The Lady magazine astrologer Victor Olliver is also the author of a best-selling horoscope book on Amazon. Kelly Surtees is based in Canada and is a widely experienced media astrologer and teacher. Adam Smith is based in London and you can hear his contributions to The Astrology Show on this website. Sarah’s Astrology is a fantastic source as she posts mundane aspects regularly and also has a great website. 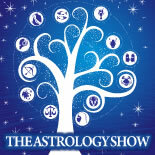 Don’t forget to follow The Astrology Show on Twitter as well.